I hope you enjoyed Part One of the Rothbury Wrap-Up. Now here’s Part Two. It’s about my sensual backstage collision with the Michigan State Police. On Saturday night, I was enjoying a nice juicy cheeseburger and the rest of The Dead’s set from the backstage area by the media tent at Rothbury. Then I heard someone running at us in the darkness ahead of us. It was past 11:30pm so I couldn’t see more than a foot in front of us to see exactly who or what was coming our way, until he was just a few inches away. The next thing I knew I was thrown down – hard. I never intended to actually taste the sandy Michigan soil while at Rothbury. But that’s exactly what I did. I went down to the ground in a blurry hurry. my left shoulder pushed back at an angle not intended for that part of my body. I felt something muscular pull. The rough gravel scrapped my knees and legs as I hit the ground. It feflt as if an NFL linebacker ( let’s say, Brian Urlacher) had just ran right over me on his way to sack the quarterback, grab the football and keep on hauling to the end zone without looking back. The lack of light kept me from seeing who it was. I had to rely on my wife Colleen’s post-smackdown play by play. She was still standing after getting sideswiped by the same the Michigan State Police officer flew through us like a seven-ten split. But as I went down I held on tight to my half-eaten cheeseburger. I wasn’t going to give that up. The kind security staff at Rothbury helped me to my feet and asked if I was okay. I brushed off the dirt from my clothes, gathered my barrings and told them I was okay. and rolled my shoulders back. I felt a second awkwardly painful pull. The soreness was already setting in. Colleen and I looked each other over for any other cuts and scrapes. We then got some freely offered legal advice from the security staff who thoughtfully recommended that I sue the Michigan State Police. I chuckled at the idea because I didn’t think that it would be worth my time. And I really knew that the officer was just doing his job. I just happened to be in his way. jump on Twitter (see my tweets below). It’s what any self-respecting social media live concert experimenting guy would do, right? 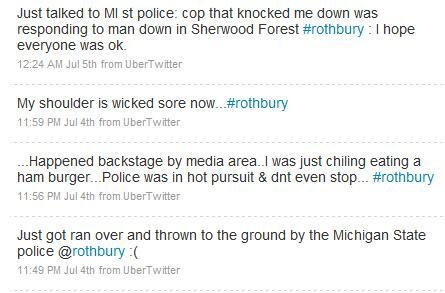 With a soar left shoulder and scrapped up left leg, I did my dramatic real-time tweet as we headed back to our tent which was also conveniently located right by the Michigan State Police Rothbury Festival Headquarters. I stopped the first MSP officer I saw and told her what had happened and asked what the officer that ran over was responding to. I was surprised that she didn’t seem to care that there was also another man down in the backstage media area. But then again, I wasn’t really surprised at all by her nonchalant response to my story. Don’t get me wrong, I have all the respect in the world for the MSP as they kept all of us safe at Rothbury. And I have no hard feelings as I know the officer was just doing his job by running me over so he could help someone else. To say the least it was a twist in my Rothbury Live Fix Twitter experiment that I didn’t see coming. And I’m a little disappointed in all my 600 followers who didn’t seem to care that I was run over by the Michigan State Police. I appreciate all my followers interest, but for the sake of this collision conversation I’ll say this. If my followers don’t care about my physical well-being then what does that say about anything else I send into the Twittersphere? I’m scared to even ask that question. But I can now say I’ve experienced one of Twitter’s greatest flaws first hand. Should something happen where you need a quick response or you’re in danger, you’d better hope some of your followers are logged in and looking for your tweets. If not, you might end up like me, or worse. But I hope you suffer not and never have to tweet that you just got run over by the police at a concert or anywhere else. The second takeaway from my smackdown by the Michigan State Police was that my encounter, although painful, was a magnificent sensual collision. I keep replaying the painful moments in time because it was the first time in my concertgoing experience that all five senses converged with such great force and vitality, all at once and in a matter of minutes. And all of it was unplanned and completely spontaneous. I’m amazed when I recall all the individual sensory elements to the collision because it reveals much about how we experience concerts. It only takes a matter of minutes, but I encourage you to take a moment to do your own sensory recall of your last concert experience. To give you an example, here’s my sensory breakdown of the collision. I was eating a juicy hamburger (Taste), not able to see (Sight) or hear (Sound) the MSP coming at all. Then wham! (Touch) the collision. I also remember the odor (smell) of the officer’s musk as he blew by us. In hindsight, I realized that this sensual collision was actually foreshadowed because I had been reading Diane Ackerman‘s excellent book A Natural History of the Senses. I highly recommend this book to anyone who wants to learn more about how our body’s sensory system is designed and how it has evolved. It’s a great book that I’ll be referencing many more times on Live Fix. It’s a fascinating revelatory read that takes you through all the 5 senses. Ackerman makes several analogies to music so its easy to insert the live music experiences in to many of her examples. Looking at the live music experience through Ackerman’s exploration of the senses has helped me better understand what makes concerts such powerful and memorable moments in our lives. Reading Ackerman’s book prior to my collision with the MSP brought to mind an interesting thought. Is there a hierarchy of the 5 senses? If so, does each individual concertgoer have their own personal sensory hierarchy during a show? Meaning, when when we go to concerts is Taste at the top of the sensory list, followed by Sound, Sight, or is it in reverse? Does it change with each concert? What is the most common sense we rely on for concerts? Though I don’t have any official scientific research, I think that, yes, we all do have some type of regular sensory hierarchy when we go to concerts. And I also believe that we all have varying degrees of sensual collisions at concerts that probably changes or evolves in some way with each concert we go to and what band is playing. That said, what fascinates me about this idea of us all having a personal sensory hierarchy, is that all of us are having many different sensory experiences during the same concert. And I often wonder what it would be like if we were to somehow be able to share them among each other. I’m not talking about swapping beers or drugs or whatever. I’m talking about sharing or communicating with each other what the final sensory result was like. Similar to what I did by telling you my sensual collision story. If you’d like to share it, I’d be interested to know what your personal sensory hierarchy is when you go to concerts. Since my sensual collision with the Michigan State Police, I’ve re-read many parts of Ackerman’s book with greater insight into what it’s like to have a intense multi-sensory experience at a concert. But I’d to wrap this post up by focusing on one sense: Touch. I now know how big a role Touch can play in helping us remember our favorite live music experiences. Though I enjoyed the Dead’s set before the collision, I don’t think I would have remembered it as vividly without the bulldozing help I received from the MSP. I can say with great assurance that I was truly “touched and moved” during The Dead’s set. Take a second to hold up your hand, look at your forearm or any fleshy spot on your body for a quick moment. Look at that spot and marvel at the relationship between your skin and live music. I did this many times at Rothbury while I read Ackerman’s book in between sets. But it was this passage specifically, from the chapter on Touch, that became even more real to me ever since my sensual collision with the Michigan State Police. …but the skin is also alive, breathing and excreting, shielding us from harmful rays and microbial attack, metabolizing vitamin D, insulating us from heat and cold, repairing itself when necessary, regulating blood flow, acting as a frame fro our sense of touch, aiding us in sexual attraction, defining our individuality, holding all the think red jams and jellies inside of us where they belong. Have you had a sensual collision lately? Is one coming your way? Sensual? How about violent? or rude? Could we agree on “sensory”? Not censorious, but maybe “you fill up my senses.” And the phrase is from what song/artist? Funny you should ask about the word “sensual.” I actually spent a considerable amount of time contemplatig the right word to describe the experience. All your recommendations were on my initial list, but I decided to go with “sensual” because it’s a fun word and the webster definition seemed to work best for the context and overall purpose of the post. It’s great to have you join the conversation on Live Fix!